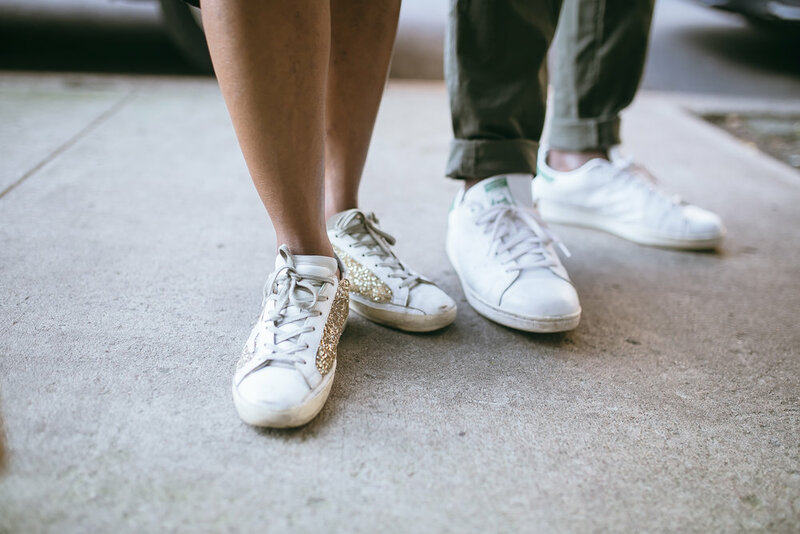 Introducing: “Together, We Dream” A new interview series on DREAM IN HD, meant to highlight the stories of couples on their dream paths together—an important narrative that we need to explore more deeply and honestly. It is often said that relationships are a “distraction” when you’re trying work towards your goals. But how true is that, really? 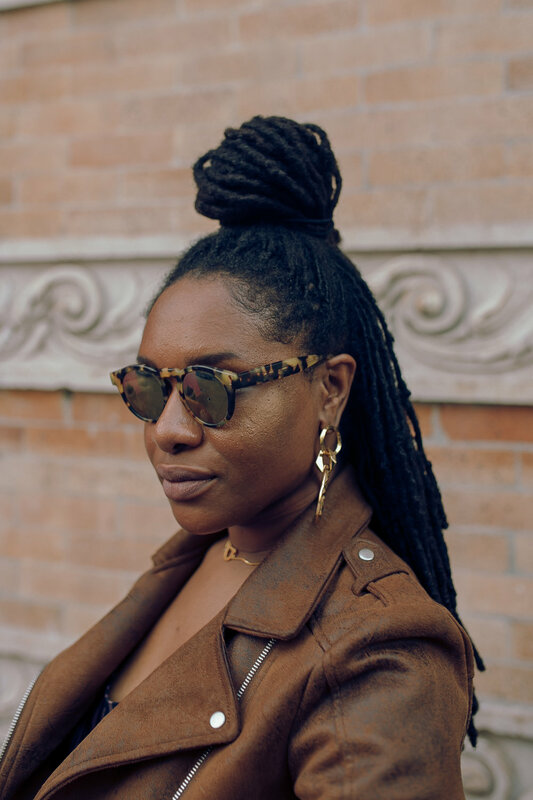 Who knew that sharing a cab with a stranger and heading to the club, could result in marriage and the birth of a stunning jewelry line? Well, we’re here to tell you it happened. Love is a funny thing like that sometimes, isn’t it? Souls find their way to each other no matter the time, circumstance or place. 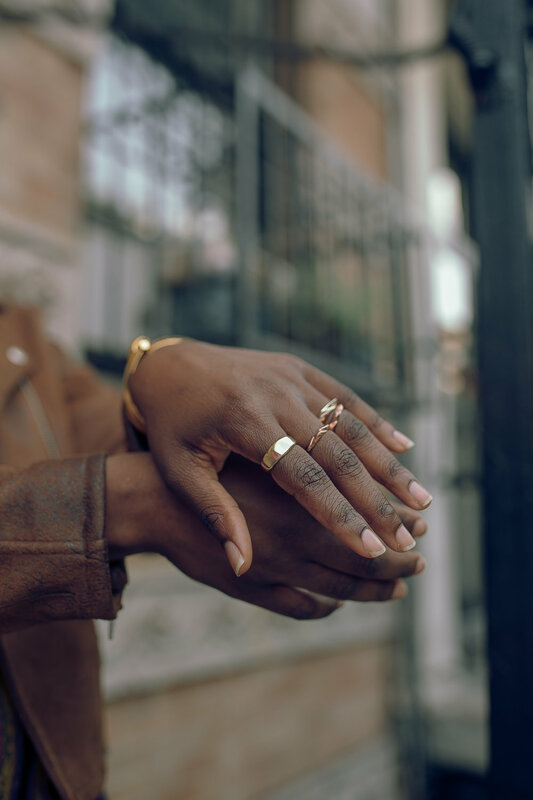 Kristin and Kofi Essel are the founders of Third Crown—a men and women’s jewelry line that fuses the couples love of geometric shapes, with the details found in their architectural surroundings. It’s also a favorite of Beyonce and a wardrobe staple for Issa and Molly in Insecure. You know, FYI. Kristin and Kofi’s partnership is grounded in acts of love and support. They lift and hold each other up. After 10 years together, they seem to just naturally groove with a special kind of synchronization. The Harlem based couple share a son, the fluffiest white pup and a connection we just had to document. How did you meet, and how long have you been together? Kristin: We met in 2007. Kofi was living in NYC and I came up here from Florida for vacation. We met in a cab on the way to the club. *laughs* We’ve been together since then and will be celebrating our 9th year of marriage this year. One thing we often hear is how “distracting” relationships can be when you’re trying to maneuver your dreams. What are your thoughts on this seemingly age-old claim? How true—or false—has this been for you? Kofi: For us, our relationship is part of the focus for our dream. Our goal is to collaborate to create something wonderful—the power of the pair. 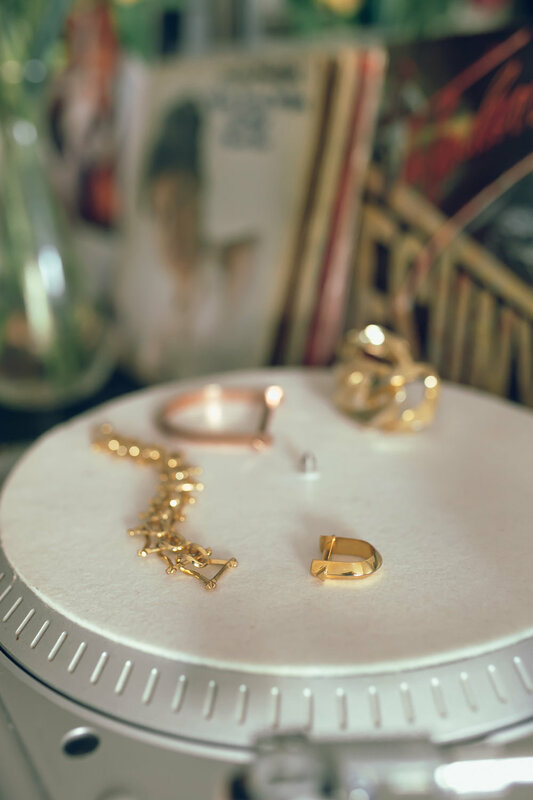 The DNA of our brand comes from the two of us joining forces to create bold and unique jewelry that we see ourselves and others in so no, our relationship is not a distraction. Kristin: I think there are some truths to relationships distracting people from achieving their dreams. I feel like it’s important to have a good balance between your relationship and your life goals. If you prioritize your relationship over your goals or vice versa, one of them is bound to fail. Luckily for us, like Kofi said, our relationship is part of our dream so our goals make our relationship stronger. When consumed and stressed with work and projects, how do you manage to make time for one another? Was there a mutual understanding from the beginning about this, or did you work together to develop it over time? Kofi & Kristin: For us it’s all one thing. We usually spend a lot of time together everyday. Whether it's taking our son to day care together in the mornings or checking out museums during the day, it’s just how our schedule is and we just go with it. Our work is intertwined with our life so we really don’t need to set out a schedule to make time for each other. In what ways have you been able to motivate each other in trying times? How does having each other’s support during these moments help rather than hurt? Kofi: We serve as each others shoulder in hard times, switching roles when needed. At the end of the day, we won’t quit so we try our best to be there for each other and push through. We take account of the progress we’ve made and keep climbing—it has proved to always be better after the rain. Kristin: It's easy for us to motivate and console each other during trying times because we both understand and can relate to what the other is going through, since we are going through it together. You are both multidimensional creatives. What’s your favorite part about being able to collaborate with the person you love? Kofi: I’m always excited to see Kristin in our pieces because I know what it took to get to this point. To see her wearing it and how confident she feels and beautiful she looks, is what I look forward to. What has been the most important thing you’ve learned from each other when it comes to following your dreams, and life in general? 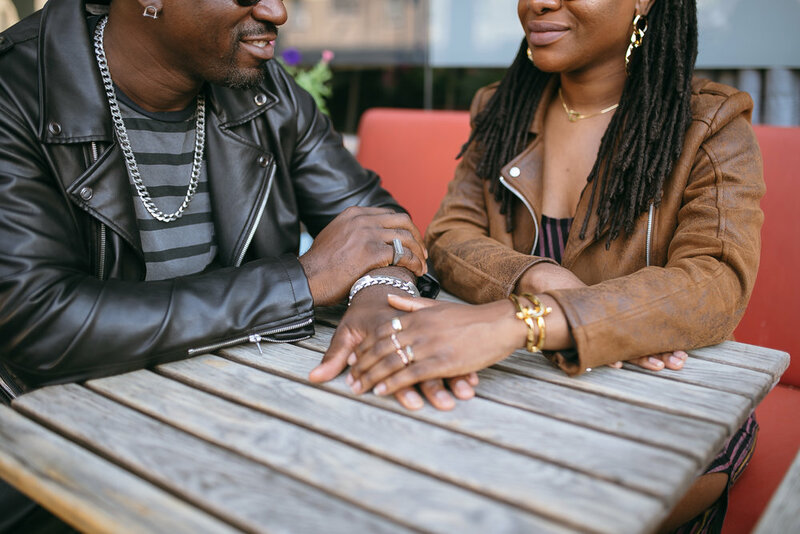 Kofi & Kristin: We’ve learned to always set goals and follow through with them as best as we can. What’s your biggest piece of advice to other couples on their life and dream paths together? Kofi: Ultimately you should both have the same goal in order to succeed together. Kristin: Communication is key. You should always express your wants and how you feel to your partner. You should both be on the same page and understanding when it comes to any situation that you will go through together. How do you both DREAM IN HD? Kofi: I DREAM IN HD by trying to visualize what I want for me and my family and trying to execute and achieve that vision. Having a positive outlook helps me stay focused and push forward to that vision. Kristin: I DREAM IN HD by staying positive in my thoughts and being confident in who I am. Holding in negative energy will really tear you down emotionally and physically, so I try to always see the brighter side of every situation and really try to understand how each situation good or bad can be a blessing in my journey. Follow Kristin and Kofi on Instagram @thirdcrown. Shop the brand here.